While neighbors, friends, and family members have turned away from one another in disgust or distrust in the aftermath of the 2016 presidential election, Arlie Russell Hochschild’s book, Strangers in Their Own Land: Anger and Mourning on the American Right, offers a daring alternative: Set aside your own agenda and listen to what the other side has to say. To do this herself, Hochschild steps out of her Liberal Berkley Bubble and travels to one of the poorest, most polluted counties in southern Louisiana. She finds friendly, kind, hardworking, government-distrusting, party-loyal, Christian individuals, who are willing to open up and share their stories with her. 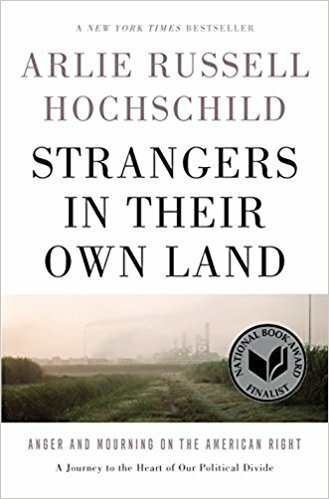 Hochschild’s book takes the reader though a web of fascinating personal stories that help to reveal the truths behind her theory of the “Great Paradox”: why Americans on the right votes against their own interests in regard to the environment. Through her thoughtful narrative style, she brings us into the deep south of Louisiana, into the hearts of petrochemical industry workers, and into the homes and communities of close-knit families that work and live in heavily polluted areas along the waterways in a stretch known as “Cancer Alley.” With her we visit community gatherings, poisoned bayous, church picnics, sinkholes, Republican ladies’ lunches, Tea Party rallies, and lively debates between those hurt by the industry and those that won’t hear of regulating it. This book is an essential read for American liberals who hope to understand (not change) their family members, friends, and neighbors who are conservative. Though her research is backed by an appendix entitled “fact-checking for common impressions,” this is not a book about anyone being wrong or right. It’s a book about listening with empathy, with the goal of understanding, not necessarily agreeing with or changing anyone’s mind. In order for us even to come to the table for conversation, we must let down our own agenda (climb over the empathy wall, not sit upon it) and listen for the other’s Deep Story. And at this place in time, that is exactly what we need to be doing. Cynthia Burrell lives in Seattle. This review is part of the Reading in Action project, sponsored and published by Blue Ear Books.